We offer 1000s of different garments and the ten listed below are our best sellers. Offering good quality with an affordable price these garments are durable and ideal for many uses. If you are unsure on any of our products or need further advice just give us a call. We are here to help!!. The white van of polo shirts, Fruit Of The Loom's SS402 is everyones favourite, its great value, tough and comes in a big range of colours to choose from. Many of our customers choose this because it is great value and lasts a long time, hands down our top selling polo shirt. Gildan have been producing quality garments since 1984. These are the GD002 ULTRA COTTON a tough tee which is hugely popular with our customers. The GD002's look great embroided or printed and come in a big range of colours. The Ultra stands for Ultra cool and Ultra reliable. More top sellers from the industry's leading brand GILDAN . Coming in with more colours than a rainbow the GD057 is a heavy weight, good looking long lasting hood at an affordable price. The GD057 is with out doubt the most popular hoodie. Kustom Kits KK705 is a smart, stylish, fitted ladies polo shirt. Like most of the top sellers it is available in many colours (above are just a few) which makes it ideal to match to your uniform colours. Embroidered they look professional but are still very practical for the more active staff roles. Another great product from one of the industrys giants Fruit Of The Loom.The SS031 is the schools and kids clubs favourites. These are very durable shirts and are a great price along with great colours perfect to match to school pe groups and other club groups. The customers favourite full zip fleece, Henbury's HB850 has a good range of colours. They are extra warm and made for embroidery . Gildans 3rd entry on the top ten favourite's list and its clear why, these ladies tee's are superior quality, a beautiful fit and a very wide range of colours and of course they are very cost efficient . 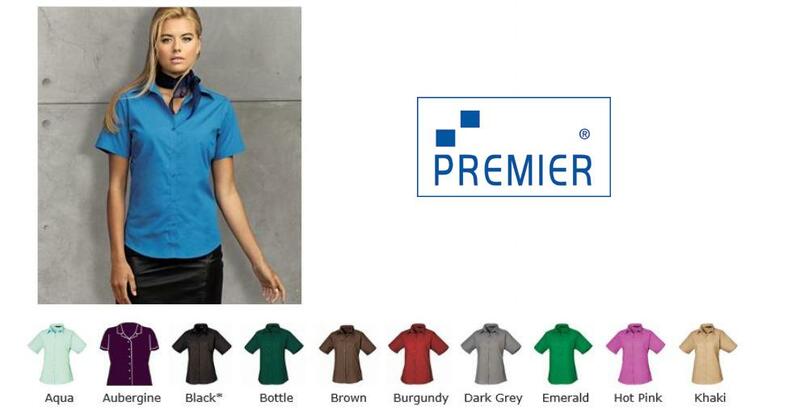 Premiers ladys blouse is our top selling ladys office shirt proffesional fit and stylish, also comes in a range of colours for all tastes, above is just a few. Embroidery works really well with these. 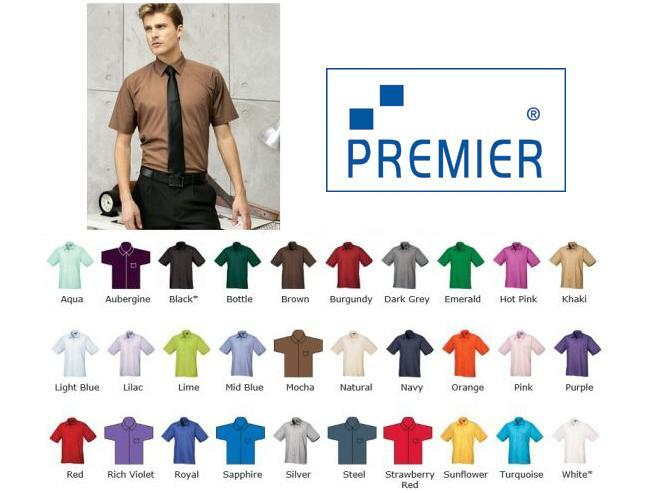 When it comes to shirts and blouses Premier are an excellent choice. The PR202 is the male alternative to the PR302 and it comes in the same colours and is favoured by our customers for its fit and style. With a matching male and female look it is a sure bet for a happy mixed staffed company. Fruit Of The Loom also has 3 products on the top 10 which is easy to understand with the extensive range of colours durability and great prices on offer. These sweats look great embroidered or printed and they stay good for years. 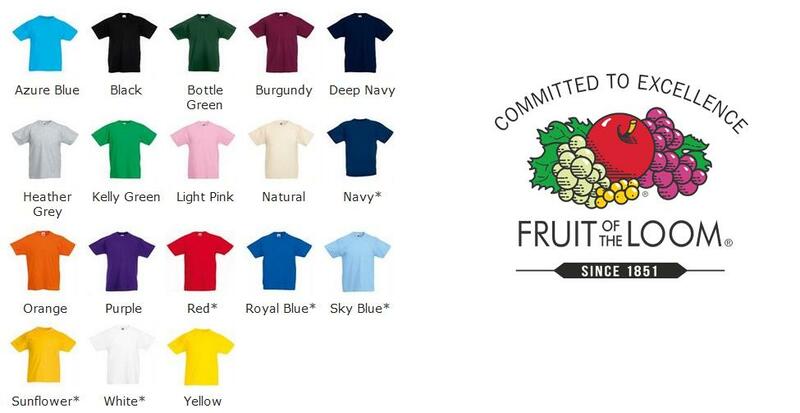 Fruit Of The Loom have been around since 1851 and the quality of their garments and others across there range show that they are experts in the industry.